Alex Tonge celebrates with the team after his short handed goal. 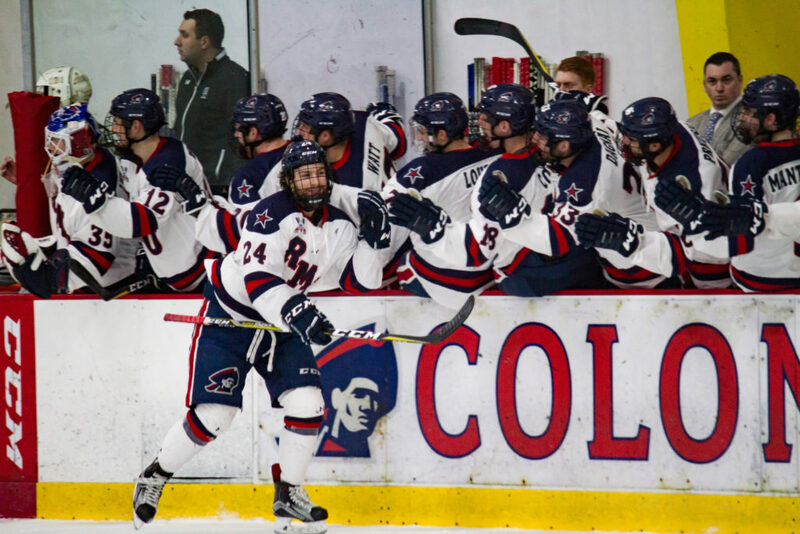 NEVILLE TWP., Pa. — Following a Friday Robert Morris victory and a Bentley win on Saturday, the Colonials faced the Falcons on Sunday for all the marbles in the best-of-three first-round Atlantic Hockey playoff series. The Colonials will forge ahead, thanks to Daniel Mantenuto’s late second period goal that stood up as the game-winner in a 3-2 victory. Robert Morris made the board first with a shot by Mike Louria from Brandon Watt and Spencer Dorowicz. Alex Tonge swooped in just minutes later, solidifying the lead with a short handed goal. Before the end of the first, Bentley’s Kyle Schmidt found his third goal of the weekend, cutting the lead 2-1 for the Colonials. Bentley wasn’t going down without a fight. Charlie Marchand nets his second of the weekend to tie the game. Before the end of the period, Mantenuto took back the lead, and collected the game winner. Robert Morris will head to Holy Cross for a best-of-three quarterfinals, the winner will head to Rochester for the semi-finals and championship. Matt Graham warms up with the Colonials before the game. Andrew Pikul warms up with the Colonials before the game. Chris Buchanan warms up with the Falcons before the game. Aidan Pelino warms up with the Falcons before the game. Timmy Moore gives Luke Santerno a shove after hitting Sean Giles. Alex Tonge tries to break up Sean Giles and Drew Callin in front of the net during the first. Nick Prkusic throws his hands in the air after colliding with Jake Kauppila in the first. Dan Mantenuto celebrates after his second period game winner. Brandon Watt congratulates Dan Mantenuto after his second goal of the weekend. RMU Men’s Lacrosse makes an appearance, to cheer on their fellow Colonials. Nick Prkusic questions the ref after making a call on what appeared to be a clean hit. Spencer Dorowicz looks for a call after Charlie Marchand hits Luke Lynch after the whistle. Elie Ghantous takes a pass from Alex Dagnal mid-ice. Sean Giles hits Brendan Hamblet during the third period. Francis Marotte falls on his back, leaving Eric Israel to defend the RMU net. RMU clears their bench at the end of the game to celebrate the 3-2 victory.